Timothy Theodore Duncan was born on 25th April 1976, in Christiansted, Virgin Islands USA. Tim is a professional basketball player playing in the positions of centre and power forward in the San Antonio Spurs team of NBA league. In addition to this, he was a member of USA national basketball team and represented the country in the Athens Olympic Games 2004 and FIBA Championships 1999, 2003. 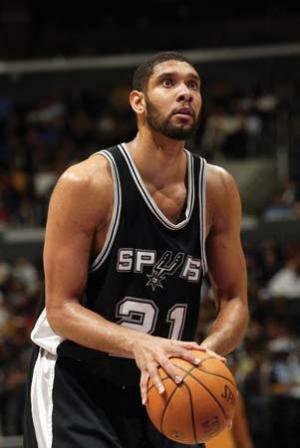 Duncan has been playing basketball professionally since 1997. Is the player wealthy? The main source of Tim Duncan’s wealth is basketball. It is reported that the overall amount of his net worth stands at $150 million and he is one of the topmost paid players in the NBA league. Duncan is reputed to have earned more than $224 million through his entire career, and signed a contract for $30 million for three years with the San Antonio Spurs in 2012. In his childhood, Tim dreamt of becoming a swimmer. He was initially successful, but an earthquake destroyed the swimming pool, and sharks dissuaded him from practicing in the ocean. More, his mother died from breast cancer, and he was completely lost. Fortunately, his brother-in-law advised him to take up basketball and he got hooked on it. He was rather awkward at first, but he played at St. Dunstan’s Episcopal High School, and later he was a member of Wake Forest University Basketball Team (1993 – 1997). While at college, he was named National college player of the year. More, he won gold together with the national team in the Summer Universiade which took place in Fukuoka in 1995. Tim Duncan’s professional career began when was chosen the 1st overall, in the 1st round of the 1997 NBA draft by the San Antonio Spurs team: he has played in the same team up to date. His personal achievements are impressive: he is only the 19th player to score 25,000 points, and is now in 14th place on the NBA’s all-time scoring list. He is eighth in rebounding, sixth overall in career blocks. He recently played his 1,330th career game for 11th on the all-time list. Together with the Spurs team, he has won five NBA championships, and as an individual has been named an NBA All-Star fifteen times, All–NBA First Team ten times, NBA All-Rookie of First Team and many other awards. Other achievements an awards include being named the Most Valuable Player twice, NBA Rookie of the Year, NBA Shooting Stars champion, San Antonio Spurs all-time leading scorer, USA Basketball Male Athlete of the Year, National college player of the year etc, etc. As a national team member, he became a bronze medallist in the Athens Olympic Games 2004 as well as gold medallist in both San Juan FIBA Championship 1999 and San Juan FIBA Championship 2003. Finally, the personal life of the basketball player is shrouded in rumours. In 2001, Duncan married his girlfriend from college, Amy, and they have two children. However, after thirteen years spent together, they decided to divorce. As a result of this rumours spread that Duncan is bisexual. It has been reported that Tim has been bisexual since the years spent at Wake Forest University. 2 He and his wife Amy have a daughter, Sydney (b. June 2005). 3 His favorite film is The Crow (1994). 4 A big Chicago Bears fan. 5 Three-time NBA Finals MVP (1999, 2003 and 2005). 6 Two-time NBA Most Valuable Player (2001-2002 and 2002-2003). 7 He was an All-American and three-time ACC Player of the Year at Wake Forest University. 8 First overall draft pick by the San Antonio Spurs in the 1997 NBA Draft.